Cover of “The Witchwood Crown” revealed! he cover for bestselling speculative fiction author Tad Williams’ new novel, The Witchwood Crown, has been revealed this week, and we at Treacherous Paths are excited to bring you this exclusive sneak peak. 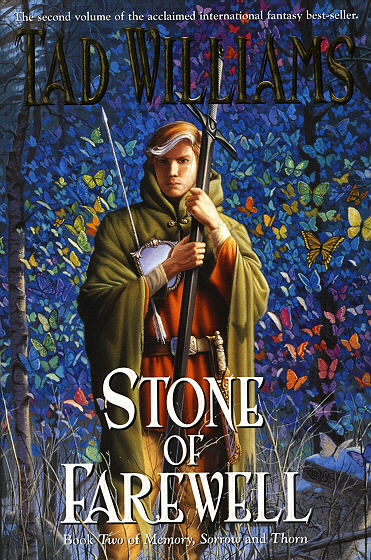 The Witchwood Crown, volume five in the four-thousand-page-long Osten Ard saga, continues the story begun in The Dragonbone Chair (1988), and subsequent sequels Stone of Farewell (1990), To Green Angel Tower (1993), and The Heart of What Was Lost (2017). It is the first volume in the “Last King of Osten Ard” series. The cover art, painted by legendary artist Michael Whelan, depicts the Hayholt, with Hjeldin’s Tower looming ominously, its red windows glowing. The Hayholt’s buildings in the background closely resemble those depicted by Whelan in 1993 for To Green Angel Tower — a nice bit of continuity. The buildings in the background appear to be in the Inner Bailey and thus are likely to be the Residence, with its dome, and Holy Tree Tower. The cover art appears on the DAW Books Advance Reader Copy of the novel, so there may be some differences between this cover and the final US edition, which will be released in June of this year. The ARC is 721 pages long, including a 25-page index. It also includes a dedication, acknowledgements, an author’s note, a frontispiece map, a foreword, and more maps. The Witchwood Crown is expected to be released on June 27, 2017 in the US and UK, with Germany, the Netherlands, and other countries to follow. It will be followed by Empire of Grass, The Shadow of Things to Come, and The Navigator’s Children.